Get guided practice plans for the 5 core acoustic skills. From changing chords to fingerpicking, you will practice right along with the instructor. Take the guesswork out of daily practice so you can focus on the most important thing: improving! A perfect companion to the Acoustic Essentials bundle, these 5 packs are ideal for late beginner to intermediate players that want a serious boost in skills. Download and own this pack for life. Free with Holiday Membership. Practice along with your teacher and get step-by-step instruction. Guided practice for the core techniques for developing guitarists. Barre chords are not something that you just accidentally get good at. It takes dedicated, smart practice to be able to play them effortlessly. Many players struggle unnecessarily and others avoid them altogether, severely limiting their song playing potential. If you have been avoiding barre chords, this pack is just what you need. The goal is to get you comfortable with playing and switching to the most common barre chord shapes. The skills you learn in this pack will allow you to greatly increase your chord vocabulary. This is not another lesson but rather a guided video practice routine you work through on a daily basis. Barre chords can be a real bear, which is why we’ve worked hard to ensure each step of this pack is fun and musical. Start with the simple 4 string barre chord shapes and work your way up to 6 string shapes using easy to follow practice videos. Playing a song on guitar is like riding a train. The rhythm and the train never stop until the end of the line is reached. But if you can’t change chords in step with the song, well, that’s a train wreck! With this practice pack, we developed a systematic way of practicing so you can tackle any chord transition that comes your way. The goal of this practice pack is to steadily improve your chord switching from simple chords like G to C, all the way to complex fingerings and voicings. Utilize this pack and gain confidence, along with mental and physical stamina. Follow along in this clearly laid out practice plan and build your chord transition skills the easiest way possible. 20 video practice routines that use common progressions. Switch chords with confidence, and practice over musical examples. Fingerpicking is one of the most challenging endeavors on guitar. Without a plan, practicing effectively is a daunting task. With this practice pack, we’ve isolated the most useful fingerpicking exercises and put them into etudes that make practicing fun. Move from the beginner to intermediate level with 20 practice routines. These routines are designed to expand your ability to play fingerstyle guitar. The goal is to make the common fingerpicking patterns second nature so you can focus on your fretting hand. These skills are a prerequisite for the many advanced fingerstyle courses inside the JamPlay member area. To making fingerpicking more natural. Apply 20 practice routines to help make common fingerpicking patterns second nature. Your daily practice routine should involve general finger strength and reach exercises. Not working on this can limit your overall playing potential or worse, lead to injuries. Most exercises of this type are boring, but with this pack we have not only made them fun, but organized them into practice routines you can easily implement on a daily basis. Good guitar playing requires a baseline level of strength and dexterity in your hands. By reducing the movements to core components, we have compiled the 20 most effective exercises to accomplish this goal. Increase your stamina during longer songs, and make barre chords and fretboard stretches more manageable. Use these 20 exercise routines to enhance your current practice routine or build overall strength and stamina. Learning a strumming pattern is a crucial step of the process of learning a song on guitar. But what if you can’t strum exactly in time with the song? This practice pack aims to fix this common problem by using 20 strumming reinforcement exercises that you can practice every day. These simple, bite-size practice videos will help you build or rebuild your strumming chops. Learn a variety of strumming styles while reinforcing consistent rhythm timing. After going through this practice pack, you should be well equipped to tackle the rhythm of most popular songs. Whether you are new to guitar or need to knock some rust off, this pack is the ideal way to get your strumming song-ready as soon as possible. You start by honing simple patterns in 4/4 timing. As the pack progresses, you will learn various rhythmic techniques as you steadily work up to advanced time signatures and busier rhythms. 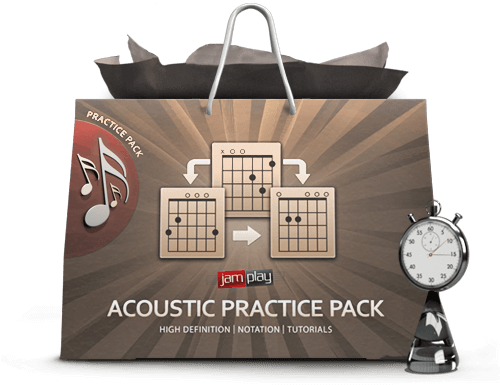 Select the Acoustic Practice Pack at checkout and get it for free. Own it for life. Limited Time only.